Plight Of Baby Lab Monkeys Reaches Congress : 13.7: Cosmos And Culture Experiments that separate newborn monkeys from their mothers came under scrutiny this week on Capitol Hill. Anthropologist Barbara J. King was among those who testified. 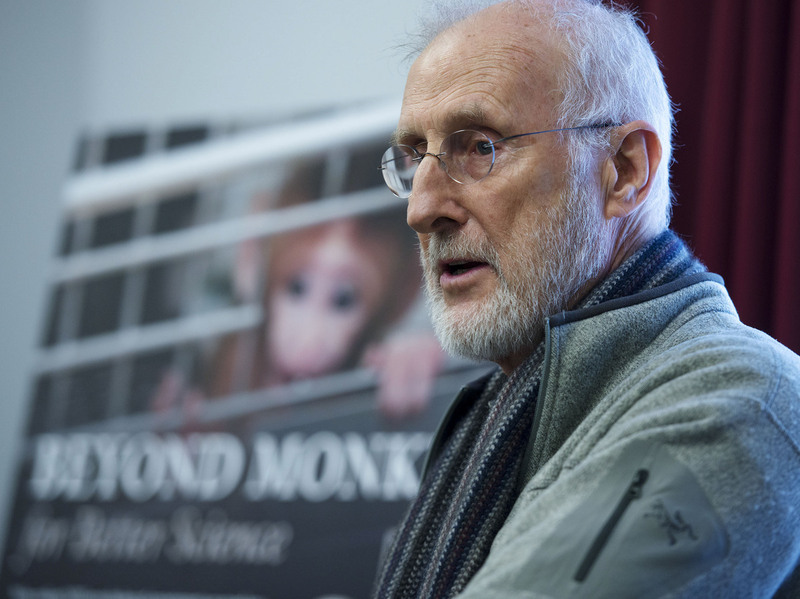 Actor-activist James Cromwell testified Tuesday on Capitol Hill about the use of infant rhesus monkeys at an NIH lab. Earlier this week, three scientists, a famous actor-activist and a congresswoman spoke on Capitol Hill about why maternal-deprivation experiments conducted on infant rhesus monkeys at an NIH lab in Maryland do not represent ethical or effective science in the 21st century. I was one of those scientists. Although I've been involved with this campaign for some months, this was my first-ever congressional briefing, and I was soaking up everything I saw and heard. It was thrilling to participate alongside Rep. Lucille Roybal-Allard, who in December led a congressional request for a bioethics review of the NIH lab. She co-hosted the briefing along with PETA, actor-activist James Cromwell and scientists John Gluck and Katherine Roe. From our different arenas of knowledge and interest, we all converged on one conclusion: NIH's Laboratory of Comparative Ethology, directed by Stephen Suomi, is causing unnecessary suffering to infant monkeys and, in Cromwell's words, its maternal-deprivation experiments "do not deserve the support of this Congress or the American people." PETA's Director of Laboratory Investigations Justin Goodman heads the team that has pushed for close scrutiny of this lab's practices by the government and the public. He told me by email Wednesday, "With standing room only and more than 30 congressional offices represented, Tuesday's briefing proved that there is significant concern on Capitol Hill about these cruel and archaic experiments as well as the political will to demand some real accountability and meaningful action from NIH, which the agency is desperately trying to avoid." A rhesus monkey mother with her baby in the wild. The goal of this NIH lab is to study the behavioral and biological reactivity in infant monkeys who are used as animal models for the study and amelioration of human mental illness, including anxiety and depression. Baby monkeys are routinely taken from their mothers between 12 hours and three days after birth, and subjected to various stressors to test that reactivity. My position at the speakers' table at the front of the briefing room allowed me to watch audience members' faces as PETA's four-minute video — showing the trauma the experiments induce in the infant monkeys — played. The attendees' intent, distressed expressions will stay with me for a long time — though the sights and sounds of the terrified infant monkeys will stay with me longer. When it was my turn to speak, I explained that as terrible as the various experimental stressors depicted in the video clearly are, the violence done to the babies' physical and emotional well-being by removing them from their mothers so early in life is, all on its own, a primary cause of emotional and physical trauma. The peer-reviewed literature, including a 2014 article co-authored by lab director Suomi, makes clear that everything from the infants' brains to their social skills are altered for the worse as a result of such deprivation. The research protocols associated with the NIH maternal deprivation studies — protocols approved through the year 2017, so far — require infant monkeys to spend 22 hours each weekday housed in individual cages near their peers. For the other two hours daily, the infants are put with peers to play, which represents a tiny positive window of social interaction with other monkeys outside their cages. That window slams shut on the weekends, when the baby monkeys don't have this two-hour play period. For a primate youngster, that combination of forcible separation from the mother and lack of significant social interaction with peers is just devastating. 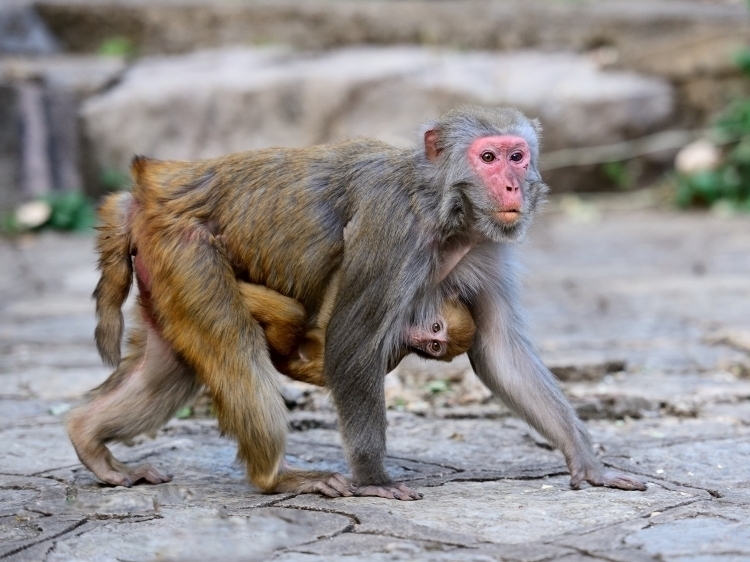 Rhesus monkeys in the wild grow up inseparable from the mom for months; the infants thrive not just on the nursing, carrying and protection the mothers provide, but also on the secure and loving base the mothers represent when the babies first toddle off to explore the larger world. NIH stands by its experimental procedures, most recently in a statement issued Monday. NIH puts emphasis on the guidelines and oversight processes that research proposals must go through before approval, which, the statement says, "provide an assurance to the general community that research with animals is scientifically legitimate and necessary, and is carried out in an ethically responsible and humane manner." I'm not moved by this defense. The bar for getting that stamp of approval to go ahead with the experiments is devastatingly too low for the baby monkeys, just as it was too low for many years for the chimpanzees housed in NIH's biomedical laboratories. In 2011, the Institute of Medicine released a report concluding that "recent advances in alternate research tools have rendered chimpanzees largely unnecessary as research subjects," and paving the way for chimpanzees to retire from laboratories, including NIH laboratories, to sanctuaries. Guidelines and oversight processes hadn't protected the chimpanzees in the past — and they're not protecting the rhesus monkeys now. Further, NIH claims in its statement that animal models are required for research on human mental health. Yet, at the briefing, Katherine Roe offered stunning examples of how U.S. scientists effectively carry out research to benefit human mental health in humane ways using people, not monkeys. Longitudinal tracking of people's life experiences, neuro-imaging of their brains, and epigenetic studies of real-time gene expression all, Roe said, are effective approaches that should render the monkey research a thing of the past. Although much more remains to be done, the past few years have seen major positive strides in stopping traumatizing and invasive research on laboratory chimpanzees. When will it be the infant rhesus monkeys' turn? Barbara J. King, an anthropology professor at the College of William and Mary, often writes about human evolution, primate behavior, and the cognition and emotion of animals. Barbara's most recent book on animals was released in paperback in April. You can keep up with what she is thinking on Twitter: @bjkingape. An earlier version of this blog post said that a group of baby monkeys is in near-total isolation during the week and that their isolation is complete on weekends. To clarify, these particular baby monkeys are isolated from their mothers and housed in individual cages in one room. Dr. Amanda Dettmer at the Laboratory of Comparative Ethology at NIH says the cages are such that the monkeys "can see, hear, smell and touch other monkeys through their enclosures at all times." The monkeys spend two hours a day on weekdays playing with peers, are often in contact with researchers on weekdays, and are checked by researchers twice on weekends.